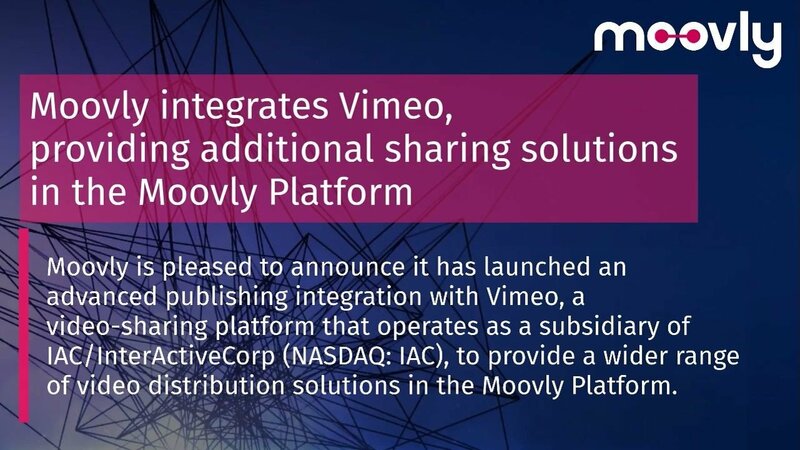 VANCOUVER, CANADA — (January 29, 2019) Moovly Media Inc. (TSX VENTURE: MVY) (OTC: MVVYF) (FRANKFURT: 0PV2) (“Moovly” or the “Company”) is pleased to announce that it has launched an advanced publishing integration with Vimeo, a video-sharing platform that operates as a subsidiary of IAC/InterActiveCorp (NASDAQ: IAC), to provide a wider range of video distribution solutions in the Moovly Platform. With over 90 million members, Vimeo is an ad-free video platform that provides creators with the tools and technology to host, distribute and monetize their videos. The number of Moovly videos published to social media continues to grow as does the demand to be able to publish on distribution platforms. As a direct response to continued demand and interest in online sharing of video content, through its Vimeo integration, Moovly users can now publish videos on their Vimeo channel with a single click, saving time and significantly enhancing the user experience. For more information on Moovly, please visit www.moovly.com.